Biblical Studies and Technological Tools: Crossway Survey: How do you read the Bible? Crossway Survey: How do you read the Bible? Crossway recently conducted a survey to see how people read their Bible, how often they read, favorite books to read, hardest to comprehend, and study tools people use, etc. 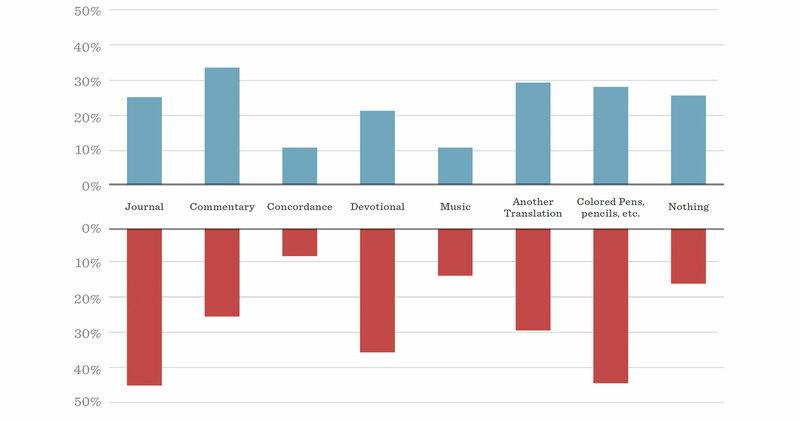 Some interesting results, but on the question of "What things do you usually have with you when you read the Bible? ", they didn't include any technology aids. (Cf. graphic above.) I know that these days I primarily am reading the Bible on my computer or phone. So, I've created my own quick, 1-question survey: "What Bible media form do you use?" Thanks for participating! For me 'other' is my e-reader which as a small tablet sized screen. Of course, Tim! I figured there had to be some other device (Kindle, e-reader) that I was overlooking. Thanks!